Did you ever notice that in almost every great war in history, France has been involved in some way? Here’s an example: France's bid for dominance in Europe in 4 major wars. 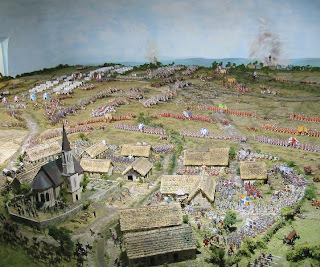 Pictured is the Blenheim Diorama at the Hochect Museum. The Battle of Blenheim, August 13, 1704, was the most daring, as well as the most significant battle of the period. The picture shows the French troops in white occupying Blenheim Village in the foreground; a line of British infantry in red screens them, while behind them, the Allied cavalry charges left into the French camp, shattering the French army.